“By the ninth grade, I had ulcers,” LaVerne Bell-Tolliver said of her experiences as one of 25 black students chosen to desegregate the five junior high schools in Little Rock over two school years beginning in 1961. Now an associate professor in social work at the University of Arkansas at Little Rock, she has recorded the experiences of 18 of those 25 students in her book The First Twenty-Five, an oral history. 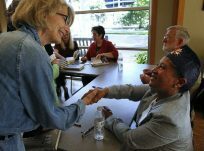 She and Wayne Wiegand, author of The Desegregation of Public Libraries in the Jim Crow South,spoke about their books Sunday at the Arkansas Literary Festival in Little Rock. Bell-Tolliver was a sixth-grader, when her parents drove her to Forest Heights Junior High School and said she’d be attending classes there instead of Paul Dunbar Junior High, the black school at the time. She and her sister were among the 25 chosen students. In 1961, Bell-Tolliver was the only black student at Forest Heights. A year later, her sister was one of two black students at Pulaski Heights. The names and addresses of all 25 were published in the newspaper. “You can imagine what that might do,” she said. One student’s home was rocked and fire-bombed before school even started, she said. Some of the 18 people she interviewed said they had repressed memories of their experiences in 1961 and 1962. They were 11-13 at the time, ages when youths want to fit in, but instead they faced hate-filled chants. One girl was spat upon. Boys were often involved in fights. Some of the boys especially had very challenging times, at West Side, in particular, where there were numerous fights, she said. The former students described for her feeling post-traumatic distress from their junior high experiences. If they were not physically attacked on a particular day, just knowing that they could be attacked at any time affected them socially and emotionally. It also affected them academically. They did not feel safe at school, and the teachers and principals did not appear to care or expect much of them, Bell-Tolliver said. Wiegand, a Florida State University professor, said it was also young people, mostly, who desegregated public libraries across the South. He showed newspaper photos and television video of black teenagers in such places as Memphis, Atlanta, Birmingham, Ala., and Jackson, Miss., being surrounded by police officers, threatened, arrested and in some cases beaten for daring to enter whites-only libraries. In one clip, white police officers in Albany, Ga., in August 1962 dragged away some black teenagers who were kneeling and singing in front of a library door after being denied entry. The youths were dragged to a police vehicle and then driven to jail. Before the civil-rights efforts of the 1960s, most black people in the South had little access to public libraries, Wiegand said. Lunchroom and park protests in the 1960s emboldened more blacks to challenge the whites-only policies of the libraries. Some city boards closed the libraries rather than allow black people to enter them. The youths desegregating the libraries didn’t receive a lot of national attention, Wiegand said. Civil-rights leader Martin Luther King Jr. seldom participated in public library desegregation efforts, he said, but by the end of 1963, most public libraries in the urban South were desegregated.